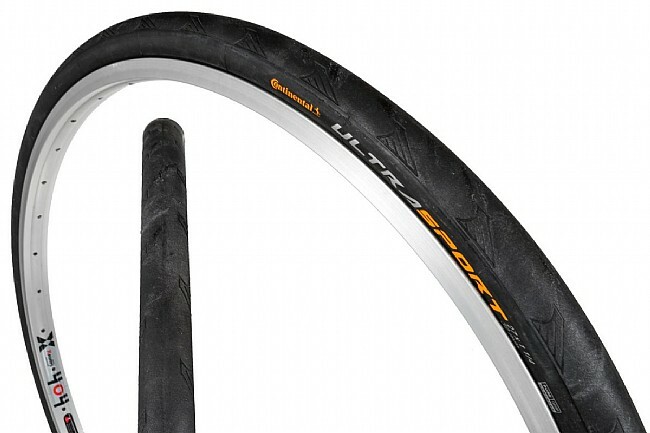 Continental's Ultra Sport II is a capable, high-mileage tire, using Conti's Pure Grip compound – ranked just below Conti's BlackChili compound for a fraction of the price. The tires provide great grip and high durability, for a long-lasting training partner that always performs. Available in 1 ⅛” or 1 ¼” widths. Wire bead. Black. A great name in tires with a unique product in this price range. This is a very grippy compound that is treadless (slicks) at the center contact patch. My experience with the product is limited to dry asphalt, where they are quiet and precise. I have gotten comments from folks thinking the tires were worn out and bald because of the lack of center tread. And the prices here are the lowest. Ive bought several of these tires and have had great success with them. Nice ride, hold up well. A little more difficult to get on the rim but not bad. I needed a tire for my 70's era Centurion road bike. This 27 14 tire is sturdy, supple and fast, love it so far. My tires size 27 in. for a daily commuter road bike. Seems like a good tire. However, as stated in other website reviews when full of air and installed the overall size of this tire increased almost to make contact with the bike frame and brakes caliper system. Make sure there is enough space for this in your bike. To install or remove the tire I need to remove all the air from the tire. There is about 18 in or less clearance between the tire and the calipers. Great tire at a good price. These tires are great. High quality and wear well. The 27 x 1 18 is a bit wider than expected and fits more like a 27 1 14. Very good deal for the price! One of the tried and true best everyday road tires out there. At a stellar price. Thanks Western! !